The meetings view lists all your past meetings (blue background) in the left column and any upcoming meetings (green background) in the right column. Your past meetings are sorted with the most recent meeting at the top and your future meetings are sorted the other way around with the first up-coming meeting at the top. This way you have easy access to your most recent meeting and your next meeting. When you click on one of the tags or the name of the organizer under a meeting title, it will be added to the filter at the top of the page. This way you can quickly find all related meetings. This filter remains when you switch from meetings to tasks and to the calendar view. 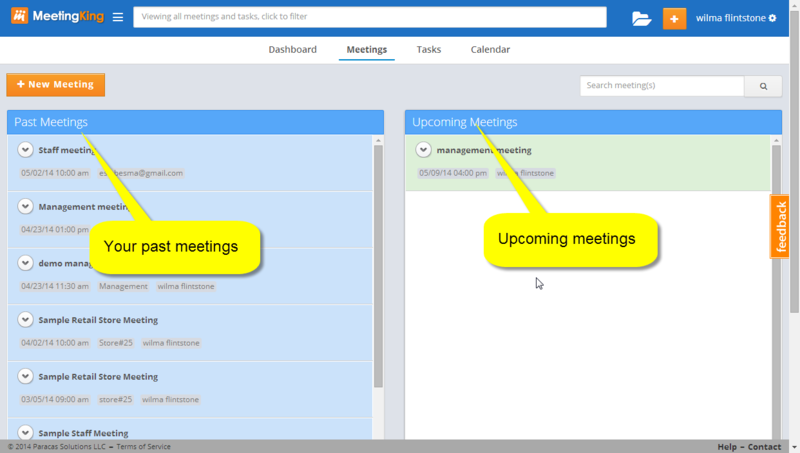 *In addition to creating a new meeting through the button in the main navigation bar at the top of the page, you can also create new meetings on this Meetings overview page. When you click the “New Meeting” button, your new meeting will automatically get the tags that you have in the “Projects / Departments / Tags” filter that the top of the page.